Rollin' down the river with Proud Mary and her krazy krewe! : Happy Birthday Clint! This weekend we celebrated Clint's Birthday and we had a great time. I get daily emails from Living Social and Groupon, so when I see a good deal I jump on it! This past weekend for Clints birthday we used 2 of them. Awesome! Savings and fun, it's a win win. My mother in law came over early for us to go to Mahony's on Magazine Street since the last time we tried to redeem our Groupon the line was INSANE. We got there early and had a hard time deciding on what to order but we went with their famous roast beef poboy and a chicken poboy. Both of them were very yummy and we can't wait to go back. After lunch we headed over to see Liam at the NICU. He is doing so well and here is an adorable picture of Liam and Clint. 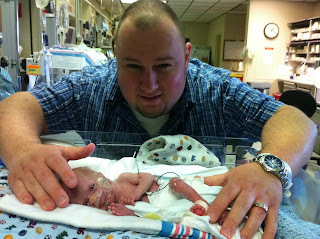 It was great to go to lunch without Noah and then to the NICU for a visit together. Thanks to my mother in law for coming over to watch Noah! For dinner that night we went to a mexican restaurant to celebrate Clint's birthday with his mom and Pop Pop Danny. We all had a great time and some good laughs. On Sunday Clint and I went out to the Melting Pot and used our groupon (it was a GREAT deal by the way!). I've found out that people either love or hate this restaurant and we both love it. We always get the same things every time we go though because they are just so good there is no reason to change it up. However, we felt a bit wild this time and chose different things and they were very yummy. Thanks to my momma for watching Noah! I hope Clint had a fun birthday weekend because I know I had fun celebrating it with you! Here's to many more! Cheers!